We exhibited at one show this year, Hamilton Sheepvention with outstanding results of a near repeat of 2016. 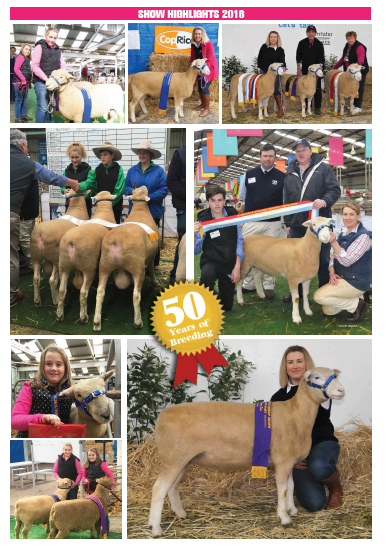 Highlights of Sheepvention included: Most Successful Overall Poll Dorset Exhibitor, Most Successful Ram Exhibitor, Most Successful Lamb Exhibitor and winning the JM ELLIS trophy for Best rams in the Naracoorte/Hamilton Region for the 3rd consecutive year, plus many firsts and seconds. A great achievement. Shellal exhibited at 4 major Sheep Shows in 2016. We exhibited at the Australian Sheep and Wool Show, Ballarat Sheep Show, Hamilton Sheepvention and the Australasian Dorset Show & Sale. Highlights included; Reserve Champion Ram, Champion and Reserve Ewe, 1st Breeders Group Ballarat. Champion Junior Sheep Handler U12 (April King) and Champion Hands On Junior Handler Shortwool U19 (April King), Supreme Poll Dorset Exhibit Sheepvention, Champion and Reserve Ewe, 1st Breeders Group, 1st Mixed Pairs, Reserve Interbreed Shortwool Group, Most Successful Poll Dorset Exhibitor, JM Ellis and Co Trophy for Most Successful Ram Exhibitor in Hamilton Region (2 years in a row), 2nd Lambplan Performance Trade $ Class (1st Victorian Stud) Sheepvention. Many thanks to the Ag Students from Good Shepherd College Hamilton who also helped us throughout the day exhibit our full team of 22 Poll Dorsets, your help was appreciated and welcomed. 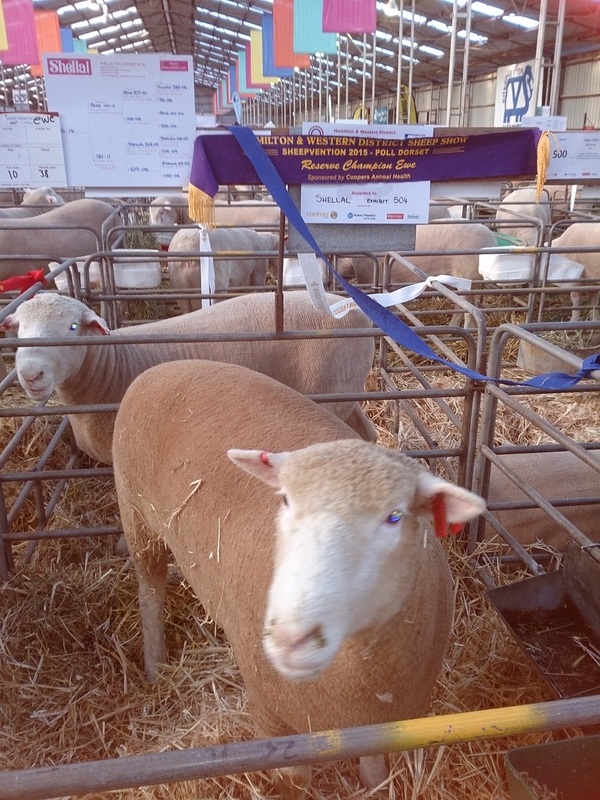 Shellal exhibited at 4 major shows in 2015 - the Australian Sheep and Wool Show Bendigo, Hamilton Sheepvention, Ballarat Sheep Show and the Australasian Dorset Championships in Bendigo. Highlights included; Junior Handler Champion (the next generation at Shellal), Interbreed Champion Ram, Reserve Champion Ewe x 2, 1st Lambplan Trade $ Performance Ram, 4th Lambplan Export $ Performance Ram and also thrilled to be awarded the JM Ellis Trophy for Most Successful Poll Dorset RAM Exhibitor within 100kms of Hamilton, 1st trade $ Ram at the Australasian Dorset Championships plus many more placings throughout the show ring over the season. Shellal exhibited a small team of 5 sheep and were awarded 7 ribbons ( 3 firsts) including the Breeders Group of 1 ram (3-13) and 2 ewes (Twins 8-13 & 9-13) who went on to 2nd place in the interbreed. Shellal 242-11 - Reserve Champion Ewe Sheepvention 2012 and 2013 and 1st Ewe with Lambs at Foot. Twin ewes 8-13 (5th Shorn Ewe Lamb ADC) and 9-13 (1st Shorn Ewe Lamb ADC) Both progeny were also awarded the Best Breeders Group of 1 ram and 2 ewes who went on to be awarded 2nd in the Interbreed at the ASBA. Shellal exhibited a large team of 19 sheep and were awarded 21 ribbons, including 1st Breeders Group of 1 ram (86-13) and 2 ewes (174-13 & 38-13) who also went on to 2nd place in the interbreed. Shellal were also awarded Champion (174-13)and Reserve Champion Ewe (9-13). Our Champion ewe went on to come 2nd in the Interbreed title also.